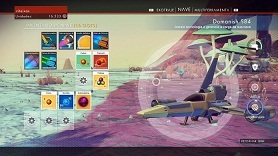 In the Survival video game “No Man's Sky,” there are trillions of planets to explore, mine raw materials, buy ships and discover alien races. However, to travel around the planets you need a spaceship and it must be refueled so that you can explore the area freely. During the first mission, you left in a desolate planet with a wrecked spaceship and the game provides you with creation and personalization systems, including the inventory of the ship and its essential components. Pressing the control button on PS4, you can access the inventory of the ship as well as the multi tool items. Through this menu, you can manage the load, install and remove certain technology components. For example: there are attribute amplifiers that serve to enhance certain attributes of the vehicle, as a defense shield more powerful and accessories that make you faster, either during the operation in the atmosphere or in space. There are two essential components to the ship without them, you can not move. The time mechanism, one of the space enhancer initially available, makes the ship reach incredible speeds, thus speeding the travel time between the planetary systems. The time mechanism, as well as any other space explorer equipment must be refilled with a type of isotope, in this case, is the Thamium9 - you can also get this by destroy asteroids. This component can be found on any planet, but you need to collect it rather than destroy it. To fill tank with fuel, hold L1 and R1 buttons simultaneously to activate spaceflight propulsion. The other item that needs to be loaded is the Booster Takeoff. With it, the ship takes a vertical thrust to leave the site, and also be useful during landing. The isotope needed to replenish the booster is known as PU, which can be found in any ecosystem. It is important to note that the takeoff procedures require sufficient levels of fuel, which means that there is no move without at least a bit of Plutonium in stock. Upon entering the ship, simply hold the R2 button from the open world.